Hazelnuts (Corylus avellana L.) are used worldwide as raw material for the confectionery, bakery, and chocolate industries. The nuts are sold both shelled and in-shell, or processed to add colour, flavour, texture, and fibre to various foods, since they are a valuable source of proteins, lipids and bioactive compounds such as phytosterols and vitamin E.
Hazelnut harvest starts, according to traditional cultivation practices, when nearly all the fruits have dropped. Thus, hazelnuts may be drying on the ground for up to three to four weeks before harvest is carried out and this can expose the nuts to microbial contamination and to adverse weather conditions. Microbial contamination, seed browning, bad taste and lipid oxidation are primary causes of quality deterioration in stored hazelnuts, affecting their marketability. These factors can negatively affect the drying process, the storability, and the final composition of the nuts. In-shell nuts are usually stored in warehouses for several months up to years. During the storage, nuts can be exposed to microbial contaminations and chemical reactions often resulting in a bitter taste perception by consumers. Another alteration that occurs during hazelnut processing and storage is the autocatalytic oxidation of unsaturated fatty acids that cause the development of off-odour and off-flavour in fruit. 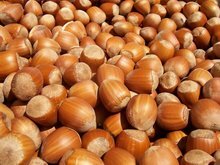 Scientists at University of Napoli Federico II (Italy) and Wageningen University (The Netherlands) have investigated the feasibility of near infrared spectroscopy (NIR) to estimate the degree of kernel defect and the level of lipid oxidation in in-shell and shelled hazelnuts. This experiment was carried out on hazelnuts of the 'Mortarellà cultivar, one of the most important not-rounded kernel cultivars grown in the Campania region. Italy is, after Turkey, the second most important producer country of hazelnuts in the world. In this study, NIR is proposed as an alternative to the traditional quality evaluation method. Several studies demonstrated that NIR is an efficient method for high-throughput screening and it is suitable to measure moisture content, lipid concentration and fatty acid composition in dry fruit, such as peanut, walnut, chestnut, etc.. Scientists explain that in hazelnut, NIR technique has been used on kernels to detect flaws (abnormal colouration of the skin and/or kernel, insect damage, detrimental disorders and fungal growth), free acidity, and water content. However, NIR spectroscopy has not been used to classify the degree of kernel defect or to estimate the level of lipid oxidation in in-shell and shelled hazelnuts. The kernels were evaluated visually, externally and internally, and by sensory evaluation with a subsequent measurement of fat oxidation. Partial least squares (PLS) analysis was used to develop calibration models. A satisfactory PLS model was created for the detection of flawed kernels. For lipid oxidation estimation the best performance of PLS models was obtained by first removing the flawed kernels from the calibration set. The PLS model for the K232 extinction coefficient, that is indicative of lipid primary oxidation, was able to predict K232 for both in-shell (R2 = 0.79) and shelled (R2 = 0.85) hazelnuts. Scientists conclude that NIR spectroscopy is a sufficiently accurate and fast technique to detect the degree of kernel defect and the estimation of lipid oxidation in both in-shell and shelled hazelnuts. Based on the results of this study, it is possible to use NIR to separate hazelnuts into different quality classes. Results suggest that it is possible to develop a two-step NIR procedure that uses a first PLS model to detect and separate flawed kernels and then a second PLS model to grade healthy kernels by lipid oxidation levels. Interesting is the capability to predict the oxidation of lipids in in-shell nuts and the ability to detect flawed hazelnuts with measurements at only four wavelengths. The latter result would be useful in the development of a low-cost commercial instrument. Source: A. Pannico, R.E. Schouten, B. Basile, R. Romano, E.J. Woltering, C. Cirillo, 'Non-destructive detection of flawed hazelnut kernels and lipid oxidation assessment using NIR spectroscopy', September 2015, Journal of Food Engineering, Vol. 160, pages 42–48.